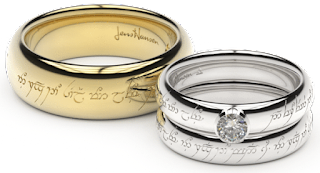 TolkienBritta.com: Matt Ferguson's Official Lord of the Rings Trilogy Set On Sale Now! Matt Ferguson's Official Lord of the Rings Trilogy Set On Sale Now! Interested in adding some cool Lord of the Rings art to your home? Bottleneck Gallery has you covered! From now until Sunday, January 15th at 11:59 pm eastern, you can order one (or all) of three officially licensed prints by Matt Ferguson! It will be a timed edition that will start Thursday, January 12th at 12pm eastern and last till Sunday January 15th at 11:59pm eastern on our homepage bottleneckgallery.com. We will also being holding a charity pin release for the Myfanwy Townsend Melanoma Research Fund. 100% of all profits from the pin will be donated to the fund in memory of Alexandra Grace, who was close to one of the members of the Bottleneck team. The pin will cost $10. This set is truly amazing, and one that every fan of Middle-earth should have in their home or office. If your interests extend to other areas of pop culture, be sure to browse more of Bottleneck Gallery's website, as they offer a variety of other products fans all over are sure to love!